Amit Shah attacked the Congress over alleged corruption during its rule. 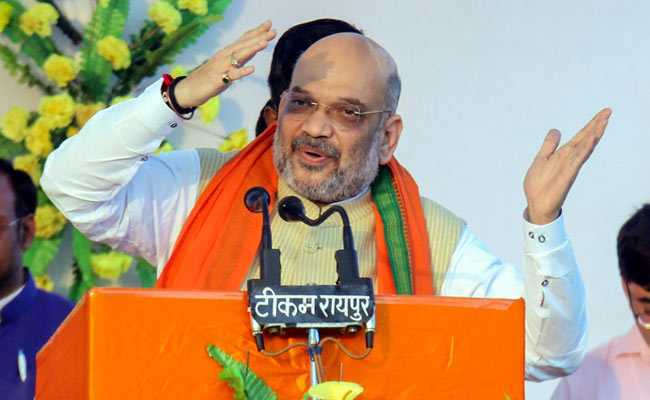 BJP president Amit Shah today compared the Mahagathbandhan, a proposed alliance of parties that are opposed to the BJP's policies, with a "band of thieves". He alleged that they looted the country's wealth by indulging in corruption. Mr Shah was addressing a rally in Rajasthan when he drew up a comparison between the anecdotal 40 thieves who were thrown out of the villages they looted by a newly appointed chowkidar (a reference to Prime Minister Narendra Modi). "All of them united and told the villagers that the chowkidar is the thief. The villagers beat them up and banished them from the village. This Mahagathbandhan is a unity of those who loot wealth of the public through corrupt means. On the other hand, there is the Narendra Modi government that has safeguarded the nation," Mr Shah said. Alleging that the Congress was involved in corruption during its rule, Mr Shah said the party had no right to question the BJP government. "In space they did the 2G scam, in the skies they did the AgustaWestland helicopter scam, on land they did the Adarsh Society scam, the scam involving the purchase of submarines spread their corruption to the seas and they stole coal from below the earth. Their corruption can be seen everywhere, today they are questioning us?" Mr Shah said. The Congress has alleged corruption in the Rafale jet deal with France which was finalised by the Modi government. Party president Rahul Gandhi has spearheaded the Congress onslaught on the issue, alleging that on government's insistence, an offset contract was given to Reliance Defence, overlooking state-owned HAL, which has expertise in aircraft manufacturing. The Congress charge has been denied by the government, the French government, Reliance and Dassault, the company that manufactures Rafale jets.